Plastic bottle crafts are great to use if you want to make affordable home decor. In fact, a repurposed plastic bottle can actually produce some pretty classy accessories. Of all the recycled materials that we have in our homes, plastic bottles or containers have to be one of the most abundant. We have detergents and cleaners, soda and water bottles, shampoos and conditioners…..you get the picture! I found a few ways that you might want to use them. Some of these are hard to believe that they are actually made from plastic bottles. So, prepare yourself to be amazed! 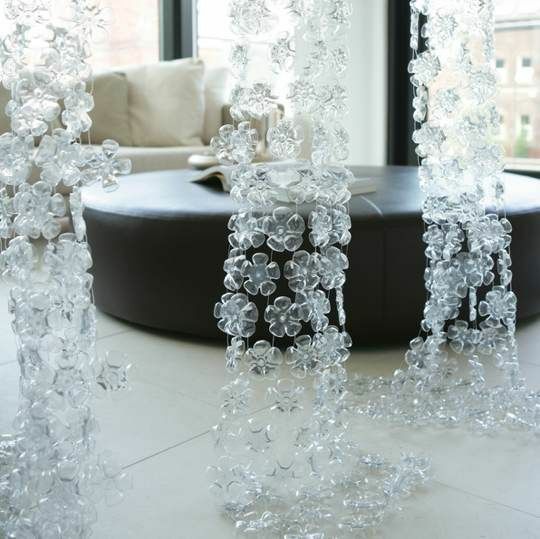 Using plastic bottles in decorating is super helpful in areas that you might worry about breakage. Having plastic decor instead of glass is perfect for kids or outdoor areas. The first ideas is actually showing how to use a plastic bottle in a more complex project. However, the rest of the plastic bottle crafts use the actual bottle in the end design. 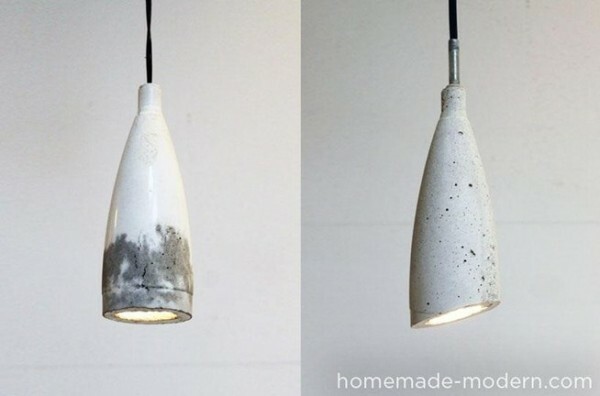 Here, plastic bottles are used as a mold to shape the concrete to make the ultra chic pendant lights. You can create a variety of different designs based on the shape of the bottles that you use. Although this one is more of a labor intensive DIY, it is a great way to create some unique lighting. 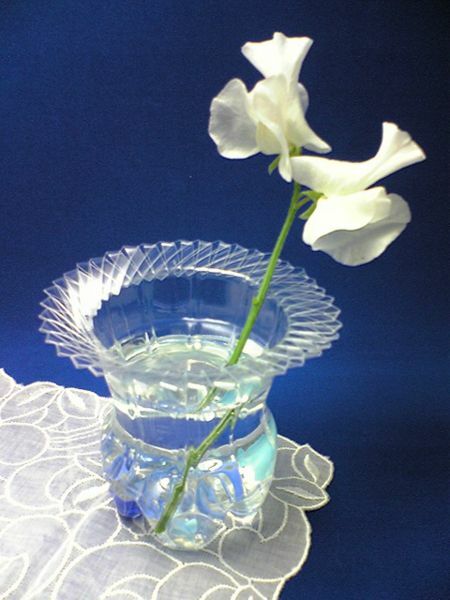 This pretty vase looks like it would be made from glass but it’s actually made from plastic bottles. No worrying about tipping over and breaking this plastic vase! These super simple plastic flowers were made from cutting the bottoms of a plastic bottle and stringing them together. Use the sections for wall art or window screens. This would be a great way to make some dividers in a girls bedroom, especially when the room is shared! 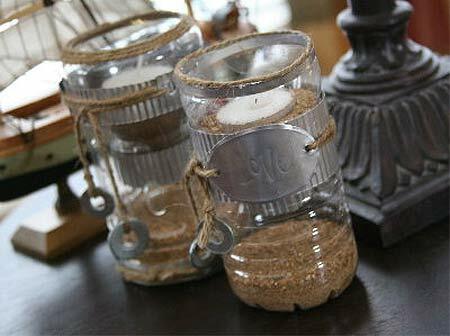 This tea light candle holder is such a fun design and uses two parts of a bottle to make up the entire candle holder. The addition of the metal accents and sand gives it some serious design! I can see using a plastic tea light holder like this on an outdoor table. No worry about breakage on a patio or near a pool. For all of you knitters, this is a great way to re-purpose those glass or plastic bottles. 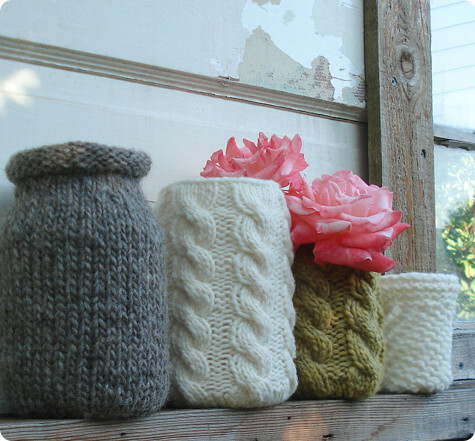 This idea is for knitting a decorative sleeve for recycled bottles. However, if you are not a knitter, there is a short cut. You can recycle an old sweater at the same time. Just cut the sleeve from a worn sweater and slip it over the bottle. Fold the cut edge under the base and secure it with glue. I have done this to make cup cozies. However, if you are not a knitter, there is a short cut.